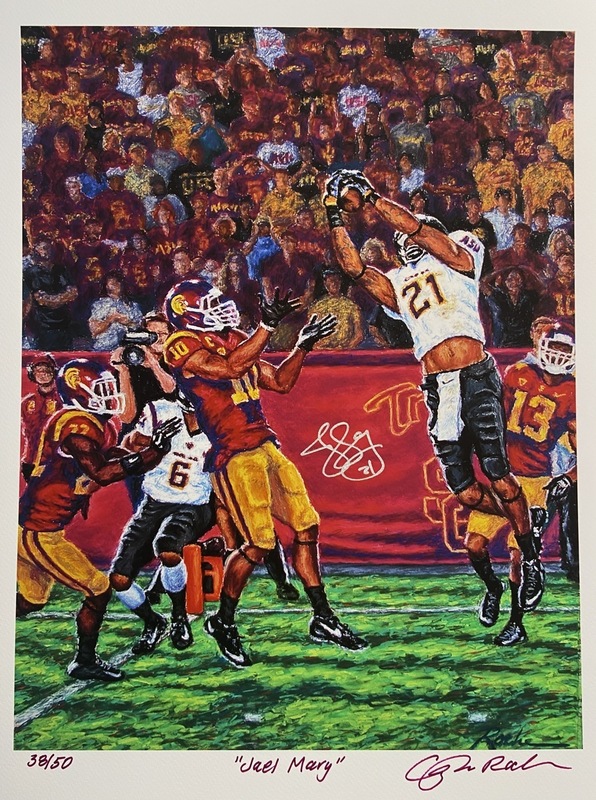 This original pastel painting captures an iconic moment in Arizona State Sun Devil football history. As Jaelen Strong snatches a pass out of the air from Mike Bercovici to score the game winning touchdown on the final play of the game, to defeat the USC Trojans at the L. A. Coliseum in 2014. The original pastel painting is available for purchase. This painting is also available as a limited edition of 50 giclee prints which may be purchased framed in a black gallery style frame with double white matting. All prints will be signed and numbered by the artist and printed on a 100% acid free heavyweight watercolor paper using archival pigment based inks, and each comes with a certificate of authenticity. Actual image size of the print is 18"H x 14"W, and will fit in a 20" x 16" frame opening. All shipping is free, order your piece of Sun Devil football history today.